Think about every marketing message you saw yesterday. Every newspaper ad. Every email. Every sign being twirled around on the side of the street. Did you stop to read each message? Watch every commercial? Think about the message? Decide if you should go for the call-to-action? No you didn’t, did you? You ignored the vast majority of the messages. A few you actually noticed and rejected. You consumed less of them. And maybe acted on a handful. And the reason is, when you saw most of those messages, you probably weren’t waiting to be sold. You were busy doing something else. Maybe something related. At best you were probably looking for a solution to a problem. Or maybe something totally unrelated and didn’t even notice the message. Now flip the script. That’s how you act as a customer, but when you’re the marketer, account executive, copywriter, art director … how do you approach each piece you create? You likely have a deep understanding of the product, the copy, even little details of the ad. Perhaps even a deep affection for the product, the landing page or the ad — after all, many marketers end up entering their work into awards shows because they’re so proud of it. As a marketer, you need to do the seemingly impossible. You need to bridge this divide for your entire team. The divide between the customer and the marketer. I found myself in this very situation recently while working on a video script for The BairFind Foundation, a nonprofit that uses sports marketing to raise awareness for missing children. MECLABS Institute has taken BairFind on, pro bono, as a Research Partner to use our conversion optimization methodology and practices, which we usually apply to business challenges, to help this nonprofit meet its own goals. BairFind has signs in 151 Minor League ballparks across the nation, with pictures of missing children. It was recently featured in USA Today. League and team presidents were hungry for a video to play in their stadiums about the nonprofit organization, and it was my job to deliver. I took what I learned from University of Florida/MECLABS Institute Communicating Value and Web Conversion graduate certificate program and began to build a customer theory dossier. I’ll show you how I used it in just a moment, but first — you can download a free version of it as well, and use it as a tool on your next ad, campaign or marketing initiative. Before you can even start building a customer theory, you must determine which type of customer you’re building that theory for. Here’s why this pre-step is so important. If you’re building an ad or other marketing pieces with a strong, unique value proposition, it will speak very directly to a specific type of customer. Boom. Hit them square in the chest, so to speak. You can’t do that if you try to be everything to everyone, if you’re blandvertising. This is also important. While there are certain types of customers you shouldn’t try to serve because you aren’t the best solution for their needs, there are other types of customers you can serve. Some marketing communications will speak to all those types of customers at once. But more likely, for most of your marketing campaigns, you’ll want to zero in on as unique and homogeneous a group as possible. As an example, here are the possible customer profiles I listed for BairFind Foundation. For the video script, I chose to focus on parents at a minor league baseball game. If you watch the video (embedded at the bottom of this article), you can see why that choice is important. I sought to grab their attention from the very beginning and hit them hard with something they could easily relate to. I couldn’t have done that if I tried to write a video for all 10 of BairFind’s customer profiles. Even just adding a second customer profile would have made that harder. This doesn’t mean that customers in those other profiles won’t be able to understand and perhaps act on the video. But it means I wrote the video with those specific people in mind. For my selected prospect profile, I began to list out some basic insights about the ideal customer — parents at a Minor League Baseball game. I started with my own gut and intuition, and expanded using some basic internet research. This was, of course, a very small project. And a pro bono one at that. But if you have a larger, higher profile project, you might want to conduct deeper research to get these insights — social listening, focus groups, interviews, surveys, etc. It helps that I’m somewhat in this demographic. (I am a parent, although the last time I attended a MiLB game was before I became a parent.) But this exercise is all the more important when you’re not in the target customer profile. Marketers often fall into the trap of “I’d want this” or “I’d want that.” But if you’re not the ideal customer for that product, the actual customer might want something very different. So this tool helps you get as close as possible to a fundamental insight — not what you’d want if you were in the customers’ shoes, but what the customers in those shoes actually want themselves. Next, categorize these preliminary insights into attributes, context, desires and fears. As you do this, it will likely inspire you and your team to come up with new insights you hadn’t considered before. The context is an important reminder. For example, you may view a print ad in isolation, nicely mounted on a piece of blackboard. However, the customer will view the ad in a newspaper with many competing articles and ads trying to get their attention. In addition to what’s in the newspaper, they may be reading in a crowded coffee shop or subway, or perhaps they’re at home with children who are trying to get their attention. In this case, we would view the video in a studio on a nice hi-def superwide Apple monitor with superb audio speakers. However, the customer may be viewing it on a washed-out screen in a noisy stadium between innings. In addition to the context, it’s important to understand your ideal customers’ desires and fears. We all move toward pleasure and away from pain. What are they trying to achieve? What are they trying to avoid? You’ll note in my example below that not everything I included directly relates to the BairFind Foundation, missing children or the call-to-action. It’s very easy for us as marketers to only focus on what we want customers to do, or the tiny sliver of their life that relates to our product or ask. However, real human beings aren’t two dimensional. And their experiences in life are much broader and deeper than just those that relate to your product. Will my kids throw a temper tantrum if I don’t by them cotton candy at the game? Will this game get rained out? Will my kids need a nap at the game? Generate a list of the most important unanswered questions about the customer’s identity and behavior. Will they be too distracted to pay attention to a video between innings? Will the donate message make them more or less likely to look at the sign? Do they understand how to text to donate? Is $2 the right amount to ask them to donate? Is a video the right way to ask them to donate? Would they refer a friend to donate? 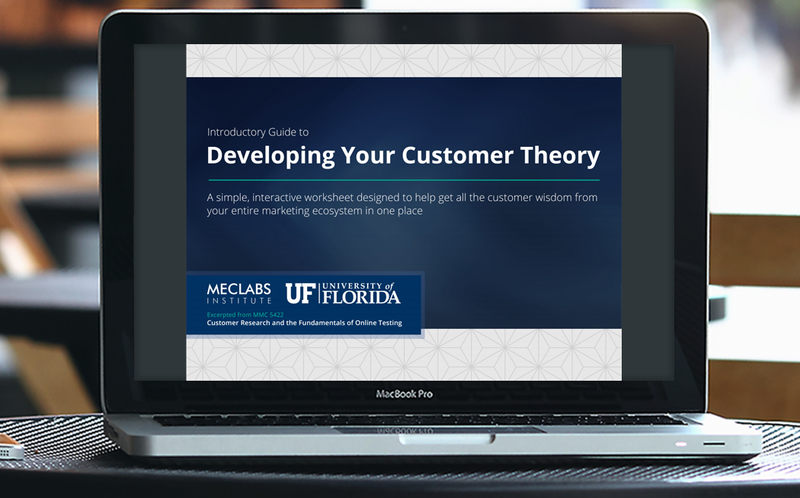 These first three steps are part of the MECLABS Seven-Step Customer Theory Development Framework that is taught in the University of Florida graduate program. The full framework also includes conducting experiments to build a robust customer theory discovered from customer behavior to answer some of these questions. In the case of this project — a simple video for a nonprofit — we were unable to go full on through all seven steps and conduct experimentation. However, I still find this step helpful because it instills humility as part of the process. As much as you have certain assumptions about the customer, it forces you to admit there’s still a lot you don’t know. It also doesn’t hurt to look back at these questions when you’re working on the next project, see what the results of the previous project were, and continue to build a base of knowledge about the customer. In addition to helping the creators of the advertisement (copywriters, art directors, video producers, etc.) get in the minds of the customer, this tool helps everyone working on the project — from an account coordinator to the vice president of marketing, on the agency side and the client-side — get on the same page about which customers will (and won’t) be talked to and what is important to those customers. This can help reduce rework, and lay the groundwork for successful creative pitches to clients. Which is what happened in this case. After I filled out the Customer Theory tool, I sent it over to Dennis Bair, Founder, The BairFind Foundation. I asked him for his perspective on the ideal customer as well, before writing the first word in the script. It’s just an example of how successful copywriting is about so much more than just great writing. So much fantastic writing never sees the light of day because it never gets the green light. Successful copywriting requires customer intimacy, but it requires client intimacy as well. Get on the same page with everyone you must collaborate with, and have the client share their key insights about the customer before you begin the creative process. Customer Theory: What do you blame when prospects do not buy?